The Elections Commission (EC) has not followed through on recommendations of the Auditor General’s Office by taking corrective measures concerning 13 cases flagged in the commission’s audit reports for 2010 and 2011, according to the EC’s audit report for 2012. The 2012 audit report (Dhivehi) made public on Thursday (June 27) listed 10 cases from 2011 and three cases from 2010 where the Auditor General’s recommendations to hold the responsible officials accountable for illegal expenses were not implemented. Among the cases highlighted in the 2011 report were expenditure on overseas trips exceeding approved funds after commission members extended their stays, MVR 334,700 (US$21,705) paid to a company contracted to provide sea transportation during the 2011 local council elections for trips not included in the agreement and awarding a contract worth MVR 4.9 million (US$317,769) to a local company to print ballot papers without going through the tender evaluation board. The 2011 audit revealed that the cost of the extending the duration of official overseas trips between January 2010 and April 2012 amounted to MVR50,438 (US$3,270) for food, incidentals and pocket money. Other cases from 2011 included MVR 183,238 (US11,883) spent to hire temporary staff and vehicles during the council elections without formal agreements, not seeking quotations or estimates from three parties as required by regulations for procurements amounting to MVR 251,148 (US$16,287), failure to collect or file court cases to recover MVR 469,500 (US$30,447) owed as fines and deposits and MVR 12,999 (US$843) paid to staff in excess of their salaries and allowances. “In addition to the 13 mobile phones that were given to employees according to documentation at the commission, the records showed that five mobile phones worth MVR 49,135 (US$3,186) were lost,” the 2011 report stated, adding that no employees were held responsible and “compensation in any form was not sought” for the losses. The 2012 report noted that of the 15 mobile phones given to staff, five have been returned to the commission while the price of one phone was reimbursed by the staff member. While letters were sent in October 2012 asking staff to return the other nine phones, the audit report noted that the letters had not been replied to as of the report’s publication. Moreover, of five phones believed to have been lost, the audit report noted that the EC was informed by staff that two were lost while the remaining three were unaccounted for. Lastly, on a recommendation to identify how nine laptops were lost and to hold responsible staff accountable, the audit report noted that the EC sent letters to two employees in November 2012 without reply, after which no action was taken. “On June 10, 2012, one employee to whom a laptop was given returned it to the commission’s stock. No action has been taken to seek compensation for the remaining six laptops,” the report stated. The 2011 audit report had also revealed that the EC made a number of unnecessary purchases, such as a coffee maker for MVR 67,000 (US$4,345) in 2007, a Nikon D200 camera for MVR 233,298 (US$15,129) in 2008, six TV decoders, 16 TVs, 16 shredders, two washing machines, irons, a deep freezer, a mixer, a blender and a gas cooker. Of 60 fax machines bought by the commission, 50 were kept unused in storage. Meanwhile, among the cases flagged from the 2012 audit, the report noted that as of March 2013 the commission had not sought MVR 20,000 (US$1,297) owed by political parties in 2012 as fines for non-submission of annual financial statements. The report noted that the commission has not taken any action concerning the non-payment of fines in addition to sending letters to the parties on August 5, 2012. The UN Human Rights Committee (UNHRC) has urged the Maldives to guarantee citizens’ right to democracy, permit freedom of religion, reform the Judicial Services Commission (JSC), abolish flogging and the death penalty, and deal with human trafficking, among other recommendations. The Committee has issued concluding observations regarding the Maldives’ commitment to universal human rights, following the country’s defence of its record in Geneva on July 12-13. The Maldivian delegation to the UNHRC was headed by Home Minister Dr Mohamed Jameel, a former Justice Minister during the 30 year rule of President Maumoon Abdul Gayoom and co-author of a pamphlet entitled ‘President Nasheed’s devious plot to destroy the Islamic faith of Maldivians’, published in January 2012. Dr Jameel was accompanied by State Minister for Foreign Affairs, Dunya Maumoon – Gayoom’s daughter – as well as the Maldives’ Permanent Representative in Geneva, Iruthisham Adam. Particular concerns included the tying of religion to citizenship, prompting the UNHRC to call on the country to revise its constitution, and abolish the crime of apostasy in legislation. The committee also expressed concern about the clause in the constitution enabling the limitation of rights and freedoms “in order to protect and maintain the tenets of Islam”, challenging the broadness of the clause and warning that such a provision could be “invoked to justify the failure by the State party to fulfil its [human rights ] obligations”. Concern was also raised about the criminalisation of homosexuality, and the “stigmatisation and marginalisation of homosexuals in [Maldivian] society”. For its part, during its defence, the Maldives’ delegation stressed that the country was a homogeneous society and spoke one language and followed one religion, adding there was therefore no debate in Maldivian society regarding the removal of the provision relating to freedom of religion. “This is not dogmatic government policy or preference, but rather a reflection of the deep societal belief that the Maldives always has been and always should be a 100 percent Muslim nation. Laws, like government, should be based on the will of the people,” Dunya told the panel. The report called on the Maldives to ensure that the Commission of National Inquiry was able to function “in conditions guaranteeing its complete independence and impartiality”, and called on the government “as a matter of urgency” to protect individuals who had provided information to the inquiry. “The Committee is concerned that such a situation undermines the judicial protection of human rights and fundamental freedoms in the Maldives,” the report stated, and called on the government to reform the JSC. 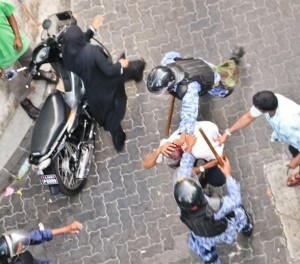 The UNHRC also called on the Maldives to abolish flogging and the death penalty. “No legislation has yet been enacted by the State party to prevent and protect against trafficking in persons. The Committee is further concerned at the lack of statistical data on the number of trafficked persons, the investigations conducted, the number of prosecutions and convictions, and the protective measures put in place, as well as the absence of a strategy to combat trafficking,” the Committee stated, calling on the government to study the root cause of the problem, provide data, punish traffickers, and provide protection to victims. Positive observations included the enactment of an Anti-Domestic Violence Act in April 2012, although the committee expressed concern at the low rate of complaints lodged for domestic violence, and at the lack of effective mechanisms of protection and rehabilitation for victims. “The State party should take the necessary measures to implement fully the Domestic Violence Act. It should facilitate complaints from victims without fear of reprisals, intimidation or exclusion by the community; investigate, prosecute and punish those responsible with appropriate penalties; and provide compensation to victims. The State party should further establish a proper mechanism of protection, including by setting up shelters and by providing psychological rehabilitation and conduct awareness-raising campaigns on the negative impacts of domestic violence,” the report noted. The Maldives is required to respond within one year detailing how it had implemented the Committee’s recommendations.